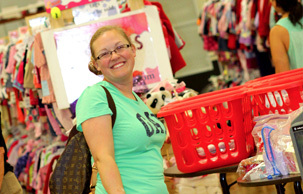 "1st time consigning. Easy process. Owner was fantastic. Great willing volunteers to help us. Will definitely do again and recommend to others. Only feedback would be to increase traffic - Saturday days are hard for most families w kids activities....maybe shorter and later hours on Saturday and longer hours on Sunday afternoon?" I like the tagging system and how many people you attract to the sale.